After a very busy weekend, Tom and I were sitting by the pond enjoying the amazing activity taking place. It seems that early evening is prime time for the birds, fish and frogs. The birds are bathing and drinking in the stream, the frogs are bug hunting, and the fish are begging to be fed. 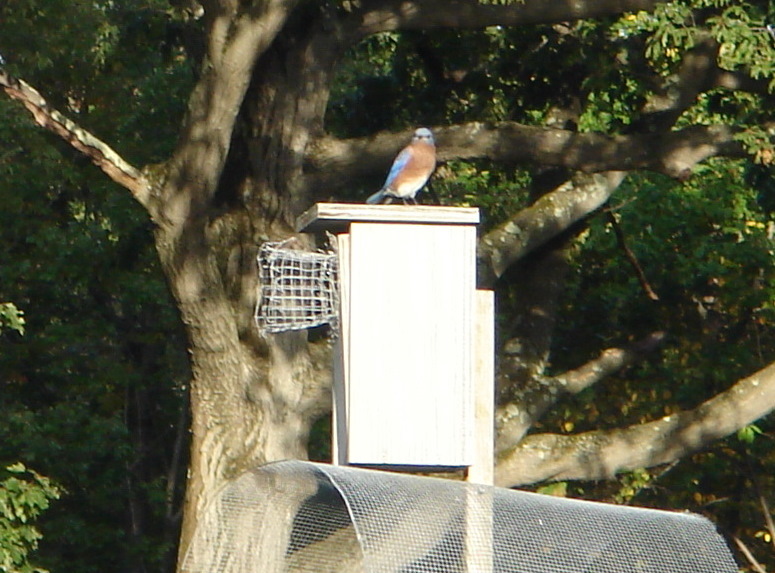 The bluebird fledges like to come back to check out their house to make sure everything is in good order for next spring, and probably to stake their claim. A chickadee in the stream. All in all, it's a pretty idyllic setting. That is, until I went to open the gate to the pool area last night at about 5:00 and was stunned to see a Great Blue Heron taking to the sky from our covered pool! For those who have never seen these rather majestic and BIG birds, here's a great photo from the web. My first thought was to check the pond. Heron are the bane of pond owners as they can empty a pond of all of its fish in very short order. Since this was feeding time, it would be normal to see all of the fish at the surface. Last night, there were none in sight. After sitting and talking (yes, they recognize me as well as my voice) I finally began to see them swimming about two feet below the surface. They obviously had been spooked by the presence of the heron and stayed at the bottom. This blog post by Full Service Aquatics, is one of the most informative I've read on the subject of protecting your fish from Herons. I felt it best to grab some netting and construct a make-shift barrier. Feeling somewhat better, I went inside to start dinner. Noticing a lot of bird activity outside the window, I went out to see (this time with camera in hand) what might be going on. The heron had returned but was outside of the pool area walking in the grass. I was able to get this photo of it as it flew over the pool and pond.